What else can I say but simply, AWESOME. 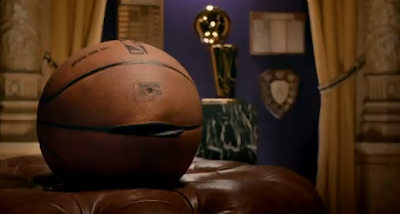 I LOVE the new commercials the NBA is pumping out during the playoffs. There are a bunch to this series of commercials, but the one I chose to feature today is the one starring Derrick Fisher, Mr. Clutch himself. Another close favorite was the one titled "Rebounds". Typically, or at least from what I have noticed, the NBA doesn't often produce comical spots like this one. The ones that do come to mind, are the bobble head ones which are pretty good too, but typically you see more of them taking a more serious tone (or at least that's what I have experienced). The commercial below is great mainly because of the personality of Mr. Spalding. Who knew you could put so many funny lines in a ball! I remember this game, and right when the Spurs thought they had it, good ol Spalding went on a shot of a lifetime destined for the bottom of the hoop. What he says on the way down is something we only have just found out. Take a look, and I'm certain you won't be disappointed.